The monthly Leading Economic Indicators publication for December 2013 highlights trends in Consumer Price Indices (CPI) and inflation, interest rates, exchange rates, international trade, agriculture, energy, manufacturing, building and construction, tourism and transport. Consumer Price Index (CPI) increased from 143.14 points in November 2013 to 143.85 points in December 2013. The overall rate of inflation declined from 7.36 per cent to 7.15 per cent during the same period. The Kenyan shilling depreciated against the US dollar, the Sterling Pound, the Euro, the Ugandan shilling and the Tanzanian shilling exchanging at an average of KSh 86.65, KSh 141.37, KSh118.18, KSh29.20 and KSh 18.63, while appreciating against the Japanese Yen and the South African Rand as at the end of December 2013. The average yield rate for the 91-day Treasury bills, which is a benchmark for the general trend of interest rates, decreased from 9.95 per cent in November 2013 to 9.53 in December 2013. The inter-bank rates declined from 10.76 per cent to 9.12 per cent during the period. The Nairobi Securities Exchange share index (NSE 20) decreased from 5,101 points in November 2013 to 4,927 points in December 2013, while the total number of shares traded decreased from 645 million to 466 million shares during the same period. The total value of NSE shares traded declined from KSh 13.1 billion to KSh 11.3 billion. Broad money supply (M3), a key indicator for monetary policy formulation, increased from KSh 1,919.5 billion in November 2013 to 1,957.5 billion in December 2013. Money and Quasi-money (M2) expanded from KSh 1,624.1 billion to KSh 1,632.8 billion over the same period. Gross Foreign Exchange Reserves increased from KSh 688.0 billion in November to KSh 739.9 billion in December 2013. Net Foreign Exchange Reserves increased to KSh 389.0 billion over the same period. The quantity of coffee auctioned at the Nairobi Coffee Exchange increased from 1,882 MT in November 2013 to 2,133 MT in December 2013 while its average auction price increased from KSh 255.55 per kilogram to KSh 274.39 per kilogram in the same period. The quantity of processed tea decreased from 44,283 MT in October 2013 to 35,463 MT in November 2013 while its average auction price fell from KSh 174.39 per kilogram to KSh 136.21 per kilogram over the same period. Average price for dry maize fell from KSh 38.12 per kilogram in November 2013 to KSh 36.88 per kilogram in December 2013 while the average price for dry beans averaged KSh 77.87 per Kilogram in December 2013. Quantity of coffee exported decreased from 3,899.2 MT in October 2013 to 3,808.2 MT in November 2013 while its value dropped from KSh 1,302.9 million to KSh 1,153.1 million over the same period. The quantity of tea exported increased from 33,531.7 MT in October 2013 to 40,054.41MT in November 2013, while its value decreased from KSh 6,977.0 million to KSh 7,834.3 million during the same period. The quantity of horticultural exports declined from 17, 689.28 metric Tonnes in October to 16,165.40 metric Tonnes in November, 2013 while the value dropped from KSh 7,290.41 million to KSh 7,182.38 in the same period. Volume of trade declined from KSh 171.5 billion in October 2013 to KSh 160.3 billion in November 2013. The total value of exports increased from 39,246.66 million to 44,301.22 million during the same period. Value of imports declined to 116,025.12 million in November 2013. Domestic exports by Broad Economic Category (BEC) indicated that food and beverages category was the main export category in November 2013 and accounted for 42.06 per cent, while the value of Non-food industrial supplies and Consumer goods not elsewhere specified registered 26.58 and 28.49 per cent shares, respectively. Imports by Broad Economic Category (BEC) indicate that industrial supplies (non-food) was the main import category in November 2013 with a share of 30.3 per cent, while the values of fuel and lubricants, machinery & other capital equipment and transport equipment registered shares of 21.87, 18.03 and 10.65 per cent respectively. Food and beverage recorded a share of 7.33 per cent while Consumer goods not elsewhere specified recorded a share of 7.74 per cent. Total electricity generation decreased from 740.22 million KWh in November 2013 to 715.79 million KWh in December 2013. Domestic consumption of electricity declined from 583.75 million KWh in November 2013 to 529.76 million KWh in December 2013. The total consumption of petroleum products dropped to 310.98 thousand MT in September 2013 from 327.30 thousand MT realized in August 2013. Average national domestic average oil prices of motor gasoline premium rose to retail at an average of KSh 110.11 per litre in December 2013 from KSh 109.17 per litre retailed in November 2013. 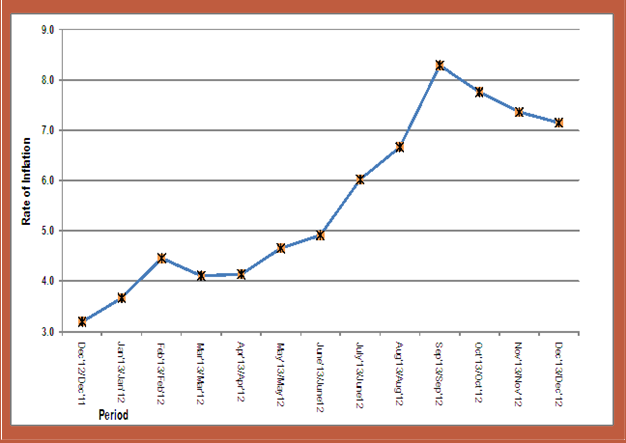 The price of light diesel oil increased to retail at KSh 105.44 in December 2013 from KSh 104.17 in November 2013. The average price for Kerosene increased to retail at KSh 83.95 from KSh 82.71 during the same period. The price of a 13-Kg cylinder of gas averaged KSh 2,876.06. In Nairobi County, average retail prices for motor gasoline increased from the retail price of KSh 108.87 per litre in November 2013 to retail at KSh 109.28 per litre in December 2013 while diesel oil price rose to KSh 104.52 in the same period. In the international market, the price of Murban crude oil increased from US Dollars 112.20 per barrel in November 2013 to US Dollars 113.85 per barrel in December 2013. Domestic production of sugar decreased from 54,752 MT in September 2013 to 53,994 MT in October 2013. Production of soft drinks dropped from 36,130 MT in September 2013 to 34,634 MT in October 2013. The production of new assembled vehicles increased from 616 vehicles in October 2013 to 643 vehicles in November 2013. The production of galvanized sheets rose from 24,533 MT in October 2013 to 25,134 MT in November 2013. The quantity of cement produced fell from 428,480 MT in October 2013 to 410,188 MT in November 2013. Consumption of cement dropped from 348,037 MT recorded in October 2013 to 338,088 MT in November 2013. Milk deliveries to the formal sector increased from 45.3 million litres in November 2013 to 46.6 million litres in December 2013. The total number of visitors arriving through Jomo Kenyatta (JKIA) and Moi International Airports increased from 97,775 persons in June 2013 to 123,812 persons in July 2013.The number of passengers who embarked at Jomo Kenyatta International Airport (JKIA) declined from 178,685 persons in October 2013 to 178,872 persons in November 2013, while passengers who landed decreased from 178,545 persons to 178,469 persons in the same period. The total number of vehicles registered declined from 15,995 vehicles in November 2013 to 12,398 vehicles in December 2013. Station Wagon accounted for 40.1 per cent of the total motor vehicles registered in December. The NSDS design team has been constituted with Mr. Benjamin Avusevwa as NSDS Coordinator. Sensitization and statistical advocacy have been and continue to be done as a “permanent activity” of the process. Some high level Government officials have been sensitized and a Data User-Producer workshop was held in September 2013 to sensitize key stakeholders. Capacity has been built through a training workshop for statisticians across government and a training workshop for the NSDS design team. A road map for guiding the whole process has been designed, instruments for collecting information have been designed, sectors for the first phase of the NSDS process have been selected, and a monthly NSDS Bulletin will been produced to keep stakeholders informed about the progress made. Kenya has a history of strategic planning for statistical development. The first five-year Statistical Plan for the Central Bureau of Statistics (CBS), then a government department in the then Ministry of Planning and National Development, covered the period 2003-2007. This plan was instrumental in the transformation of the CBS into a semi-autonomous Government Agency, Kenya National Bureau of Statistics (KNBS), by an Act of Parliament (the Statistics Act No.4 of 2006). KNBS core mandate is outlined under the said Act that empowers the organization to be the principal agency of the government for collecting, analyzing and disseminating official statistical data in Kenya. The Act further empowers KNBS to be the custodian of official statistical information, establish standards and also promote the use of best practices and methods in the production and dissemination of statistical information across the National Statistical System (NSS). The second plan covering the period 2008-2012 was based on a comprehensive review of the previous Strategic Plan and lessons learnt. The process of designing the third plan, called the National Strategy for the Development of Statistics (NSDS) has started. While the first two plans focused on the Bureau, the third plan will cover sectors (government ministries, departments and agencies –MDAs, with KNBS and Counties as special sectors). International “best practice” requires that NSDS design process should follow a sectoral (or bottom-up) approach whereby a Strategic Plan for Statistics (SPS) is designed for each sector and the SPSs are used as building blocks for the overall NSDS (see figure below). This approach leads to enhanced coordination of the National Statistical System. It is fortuitous that the design of the NSDS has coincided with the design of Strategic Plans for MDAs and Counties. This coincidence creates a good opportunity for inter-linkage between Sector Plans for Statistics and Strategic Plans for MDAs. The design of the NSDS also takes place at a time when a new Constitution has come into force. The Constitution places a lot of emphasis on accountability which calls for evidence-based policy, planning, decision-making, monitoring and evaluation at the centre and in the counties, and hence the need for comprehensive and quality data.